Russia's economy expanded last year at the fastest pace since 2000 as a record flow of money into the country spurred capital investment and a consumer boom. 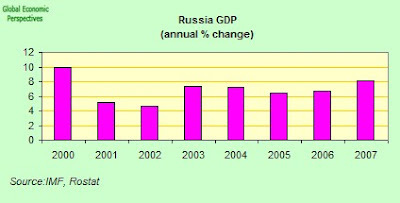 Growth, at an annual 8.1 percent, beat government forecasts and compared with a revised 7.4 percent rate in 2006, according to the Moscow- based Federal Statistics Service today. The pace is faster than the government and economists expected, with Finance Minister Alexei Kudrin yesterday saying 2007 growth reached 7.8 percent. The world's biggest exporter of crude oil and natural gas has entered its 10th consecutive year of growth, boosted by rising incomes and consumer spending. Net capital inflow almost doubled in 2007 to $82.3 billion. 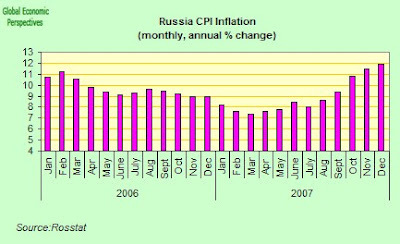 At the same time end of year inflation was running at 11.9% in Decemeber 2007. 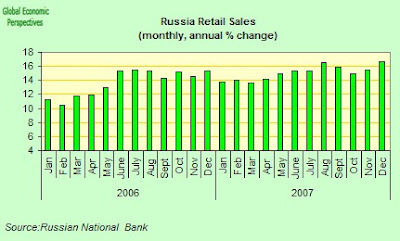 Russian retail sales growth accelerated in December for a second straight month as revenue from energy sales boosted wages and spending. Retail sales grew 16.7 percent in December from a year earlier, compared with a revised 15.5 percent in November, the Moscow-based Federal Statistics Service said earliertoday. Sales jumped 20.3 percent from a month earlier because of holiday shopping. For the year, retails sales grew 15.2 percent. Wages increased an annual 16.2 percent in December, reaching 18467 rubles ($754), the Statistics Service said. Real wages grew 16.2 percent in 2007, compared with the year before. 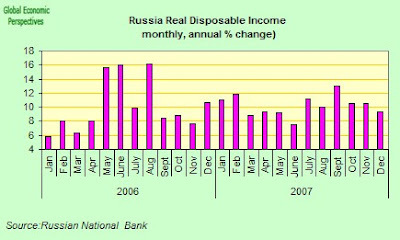 Disposable income increased an annual 9.4 percent in December and rose 10.4 percent in 2007, it said. 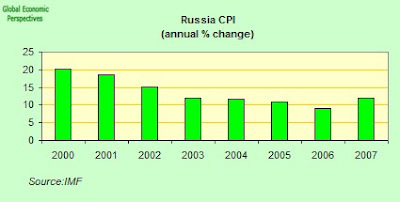 Russia's inflation rate rose in 2007 to the highest in four years in December as the government proved unable to put a brake on food prices and wages even while investment soars. The rate for the year rose to 11.9 percent from 9 percent in 2006, the first time that the rate has surpassed the previous year since 1998, the Moscow-based Federal Statistics Service Rosstat said today. Consumer prices rose 1.1percent in December, compared with a 1.2 percent advance in November. Russia, the world's biggest energy exporter, has struggled to curb inflation as record oil income has boosted salaries and global food prices have increased. In an attempt to try to stop the upward march of food prices the government cut dairy and vegetable oil import duties, sold grain from state reserves and added a grain export duty. A number of companies even agreed in October to freeze prices on some milk, vegetable oil, egg and bread products until Jan. 31. Food prices rose a monthly 1.6 percent, compared with 1.9 percent in November. Food price growth was led by fruit and vegetable prices, which slowed from November's rate of 6.2 percent to 5.6 in December, according to the statistics service. The Organization for Economic Cooperation and Development said in a December report that the Russian government's ``massive additional spending'' before elections also helped push up inflation. Legislators approved additional budget outlays this year as the nation prepared to hold parliamentary elections on Dec. 2 and a presidential vote in March 2008.